Like in wordpress you do not have any SEO plugin for Blogger in order to get on-page optimization tips and suggestions. So people who use Blogger don’t maintain and follow some common SEO principles. The most common thing many fail to do before posting content is to optimize their images. To make your blog post interesting at least have single image in each of your blog post. So at their very first look your site visitors will know what the post is all about. Having proper titles and alt tags to your Blogger images will not only help your visitors, but it also gives a good bump to your SEO. This post is all about optimizing images in Blogger and so we will discuss how to add alt tags to Blogger images and some common image optimization techniques for Blogger. As you all know Google image search is most popular service to find images, graphics and icons from all around the World Wide Web. You, me and many people use Google images in order to find images. So you must consider and accept that a part of blog traffic depends and comes hugely from image search engine. If you are a regular visitor to Blog Time Now then you can notice that we do not even publish a single post without images in it. Search engine bots considers only text and they don’t make much sense to media files unless the image has proper alt attributes defined. So always tag images properly in Blogger posts for better SEO. Image tag <img> is an HTML language that is used to display images in webpages. Image tag will have three attributes and they are src (image source), title (image title) and Alt (alternative text for image). When you add images in your Blogger posts, img src is defined, but what about the title and alt tags. Simply adding this<img src=”image link”/> image tag in your blog’s HTML editor will display an image, but search engine robots don’t understand what the image is about. That’s why you have to add alternative text for your Blogger images. In order to categorize and describe images to both your visitors and search bots you need to add title and alt attribute. For example let’s say you are making a post about “Blogger images” and you are focusing on this keyword “how to add alt tags to Blogger images”. So you should define the image tags properly like this. In the above tag you can see three attributes alt, src and title in which alt is for bots which has keyword in it and src is the image source and title is for your visitors. Consider the following tips to best optimize images in your Blogger blog. Here are some few tips for you to properly add alt tags to your Blogger images, graphics and photos. For both image title and alt tags do not add more than 10 words. 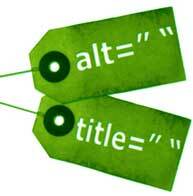 Consider adding your focus keywords in all your image alt tags. Better is to add your post title for alt tags. Do not spam! It is not a place where you add your Meta keywords. For example if the focus keyword for your article is “how to optimize images in Blogger” then just add alt tags like this “optimizing Blogger images” or “optimizing images in Blogger”. Always have an introduction image in each blog posts just like you see it here. We always consider adding and intro image to all our blog posts. Follow all the above tips, now we will see how to add alt tags to Blogger images. Login to your Blogger blog and go to post or page editor. Now upload image in normal compose mode and select the image. Now you will get several options for images. Click properties to add title and alt text. In image properties add title and alt text that is your focus keyword. Click OK, save changes and you are done adding title and alt tags for your images. In your Blogger blog post editor switch to HTML view and add just like the one below. <a href= “–“is where the image is linking to, img alt is where you add your keyword, src is the image source URL and title is for image title. Hope this post helped you on how to add alt tags to Blogger images and also you have learned some image optimization tips. Share it and post your comments below as well as to get more updates from us subscribe to our RSS feeds.